You have 6 seconds to perform. 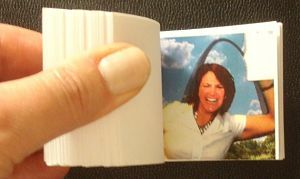 Last month I spoke at the Missouri Meetings and Events Expo “Boot Camp” in St. Louis. During the cocktail reception, I wandered by an activity that might be included in your silent auction. A green screen was set-up in front of a camera. Fun props were piled on a table nearby. In essence, the subject (moi) selects a background and then “performs” in front of the camera for 6 seconds. Record A Hit had several backgrounds. I selected the St. Louis arch, given our location. Next I had to think of what I was going to do in front of the camera for 6 seconds. Groups can perform together, but more than 4 or 5 people won’t fit into the frame. Some guests sang and played air guitar; others danced or interacted in silly ways. I scanned the room for the fun Doubletree sales rep I’d met earlier but — not finding her — decided I needed to perform solo. I opted to pretend like I was at a Rams game cheering on the team … which is pretending as I have as much interest in football as I do cooking. Which is to say, nada. 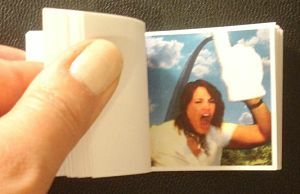 The photos are assembled into a flip book. The two videos at the bottom of this post and my photos will give you an idea of the book’s progression. If you’re seeking some new silent auction entertainment ideas, this activity would work. You might consider charging, depending on your fundraising gala. 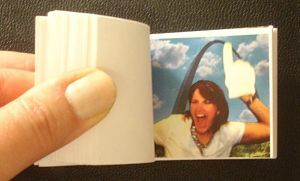 “Flip” through the book to enjoy a mini-movie. You’ll want to check with Robert Broms of Record a Hit, but I think he told me that a 3-person crew can complete 75 booklets in an hour. Knowing that, small galas would likely be a better fit, or — if you’ve got 1,000 people attending your event– you’d have to bring in more crews to create the books. I can see parents wanting to take this home to show the kids. It took about 5 minutes for them to complete my flip book. With the cutting and assembling required, there is more handiwork involved than creating a typical portrait. 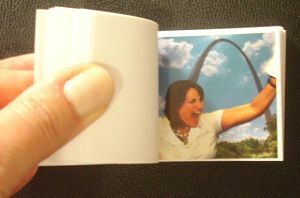 Flip books would be appropriate for silent auctions. If more than one copy of the flip book is assembled, it takes longer. Had I performed with my Doubletree friend and we’d both wanted copies, the wait time would be longer. I’ve written before about the best silent auction ideas for entertainment, but not posted them on the blog. To ensure you don’t miss future ideas, subscribe to my free e-zine, Benefit Auction Ideas. PODCAST: Searching for new silent auction entertainment ideas? 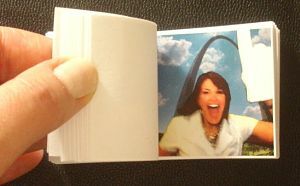 Try a flip book. Thank you, I am going to steal this idea it is so good! Jerome: You can make 300 sketches slightly different and assemble them into a book. Just like early Walt Disney. the videos are great. I watched you “flip” and laughed so hard I can’t stand it. This is wonderful. Do not know why it tickled me so but your words, your actions and the “flipp’n” just cracked me up. I’m always happy to bring some light humor to my readers …. How fun is that? Sherry you come up with the best stuff!